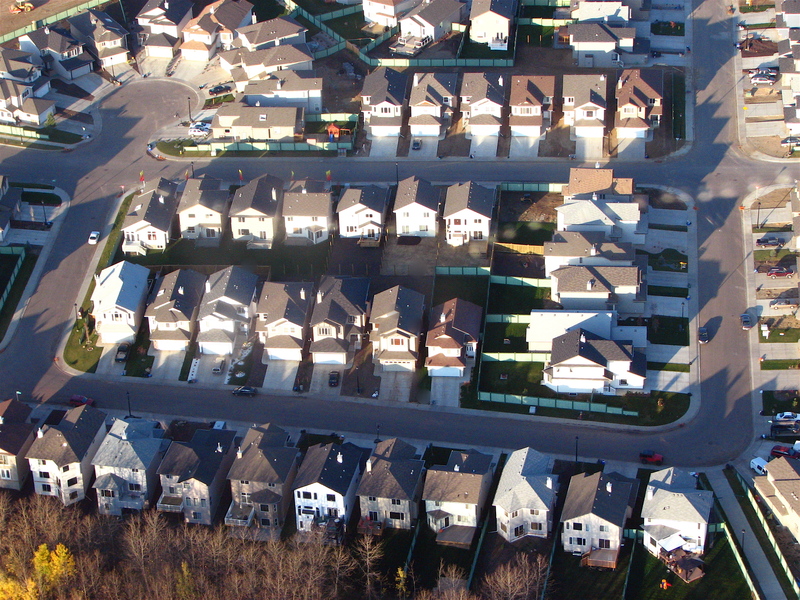 A residential subdivision in Lewis Farms, West Edmonton. I was lucky enough to get to go up in a helicopter last week for work. What an amazing experience. We were in the sky for over an hour and saw most of the part of the city that I work in, as well as a good chunk of the rest of it as well. You can cover a lot of ground in short period of time in a helicopter. It was great to be able to see everything at a glance, as we imagine it from maps, as compared to looking at a piece of land from the road, or even walking across it. Edmonton sprawls a lot. It was an incredible perspective to see the city from, but you could also see how disconnected so much of it is, how circuitous the routes are, how same-y the residential areas, and even more so the industrial areas, are. 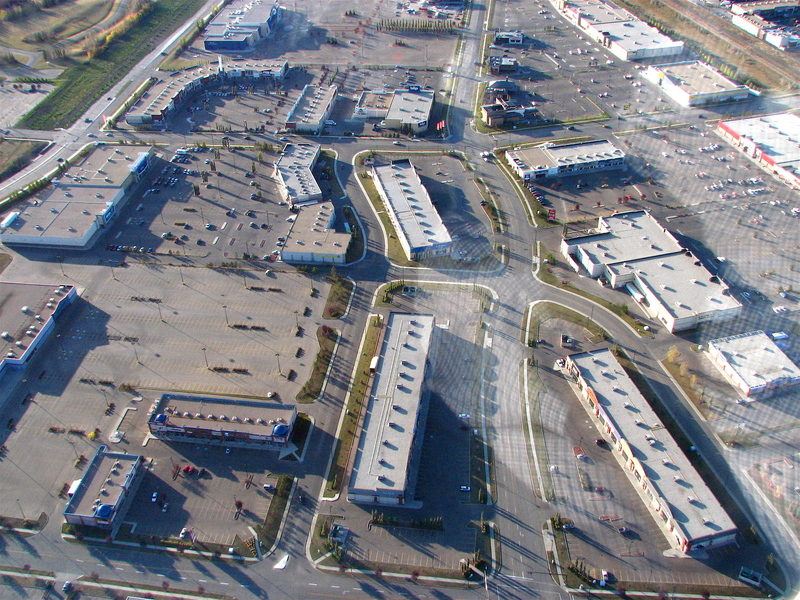 South Edmonton Common: the discarded Wal-Mart location is at bottom left. And the big box developments. Well. 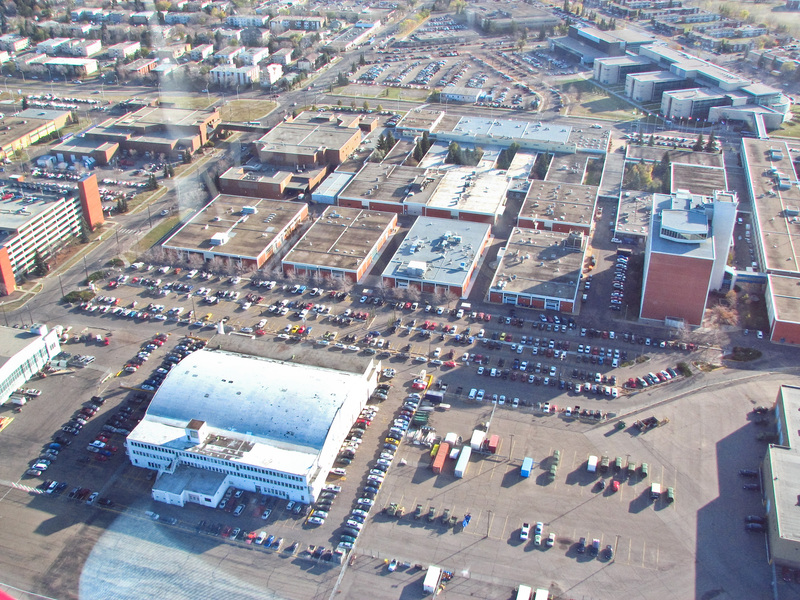 As we flew over South Edmonton Common, I noticed the empty parking lot of the Wal-Mart store. That seemed so odd to me: when would a Wal-Mart parking lot ever be empty? Then I remembered that they recently opened a second, much larger Wal-Mart further south in SEC. The old store is just sitting empty. Will it ever be taken over by some other company? How many retail stores need that much space? Big box developments are so poorly-designed: hostile to pedestrians, not even all that functional for drivers, and highly unadaptable to other uses. In the case of the old Wal-Mart store, it only took them seven years to discard it. I took tons of photos from the helicopter. I’ll post more to flickr once I have a chance to edit them all.